(PhysOrg.com) -- NASA-funded scientists have discovered amino acids, a fundamental building block of life, in a meteorite where none were expected. "This meteorite formed when two asteroids collided," said Dr. Daniel Glavin of NASAs Goddard Space Flight Center, Greenbelt, Md. "The shock of the collision heated it to more than 2,000 degrees Fahrenheit, hot enough that all complex organic molecules like amino acids should have been destroyed, but we found them anyway." Glavin is lead author of a paper on this discovery appearing December 15 in Meteoritics and Planetary Science. "Finding them in this type of meteorite suggests that there is more than one way to make amino acids in space, which increases the chance for finding life elsewhere in the Universe." Amino acids are used to make proteins, the workhorse molecules of life, used in everything from structures like hair to enzymes, the catalysts that speed up or regulate chemical reactions. Just as the 26 letters of the alphabet are arranged in limitless combinations to make words, life uses 20 different amino acids in a huge variety of arrangements to build millions of different proteins. Previously, scientists at the Goddard Astrobiology Analytical Laboratory have found amino acids in samples of comet Wild 2 from NASAs Stardust mission, and in various carbon-rich meteorites. Finding amino acids in these objects supports the theory that the origin of life got a boost from space -- some of lifes ingredients formed in space and were delivered to Earth long ago by meteorite impacts. When Dr. Peter Jenniskens of the SETI Institute, Mountain View, Calif., and NASA's Ames Research Center, Moffett Field, Calif., approached NASA with the suggestion to search for amino acids in the carbon-rich remnants of asteroid 2008 TC3, expectations were that nothing was to be found. Because of an unusually violent collision in the past, this asteroid's ingredients for life were a "culinary disaster" and now mostly in the form of graphite. 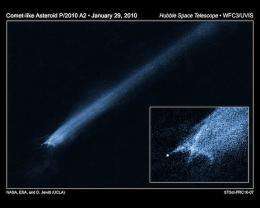 The small asteroid, estimated at six to fifteen feet across, was the first to be detected in space prior to impact on Earth on October 7, 2008. When Jenniskens and Dr. Muawia Shaddad of the University of Khartoum recovered remnants in the Nubian Desert of northern Sudan, the remnants turned out to be the first Ureilite meteorites found in pristine condition. A meteorite sample was divided between the Goddard lab and a lab at the Scripps Institution of Oceanography at the University of California, San Diego. "Our analyses confirm those obtained at Goddard," said Professor Jeffrey Bada of Scripps, who led the analysis there. The extremely sensitive equipment in both labs detected small amounts of 19 different amino acids in the sample, ranging from 0.5 to 149 parts per billion. The team had to be sure that the amino acids in the meteorite didnt come from contamination by life on Earth, and they were able to do so because of the way amino acids are made. Amino acid molecules can be built in two ways that are mirror images of each other, like your hands. Life on Earth uses left-handed amino acids, and they are never mixed with right-handed ones, but the amino acids found in the meteorite had equal amounts of the left and right-handed varieties. The sample had various minerals that only form under high temperatures, indicating it was forged in a violent collision. It's possible that the amino acids are simply leftovers from one of the original asteroids in the collision  an asteroid that had better conditions for amino acid formation. Dr. Jennifer Blank of SETI has done experiments with amino acids in water and ice, showing they survive pressures and temperatures comparable to a low-angle comet-Earth impact or asteroid-asteroid collisions. However, the team thinks it's unlikely amino acids could have survived the conditions that created the meteorite, which endured higher temperatures  more than 2,000 degrees Fahrenheit (over 1,100 Celsius)  over a much longer period. "It would be hard to transfer amino acids from an impactor to another body simply because of the high-energy conditions associated with the impact," said Bada. Instead, the team believes theres an alternate method for making amino acids in space. "Previously, we thought the simplest way to make amino acids in an asteroid was at cooler temperatures in the presence of liquid water. 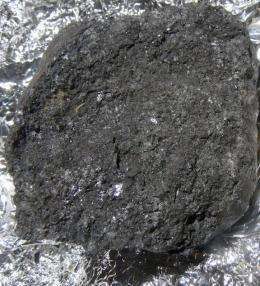 This meteorite suggests theres another way involving reactions in gases as a very hot asteroid cools down," said Glavin. The team is planning experiments to test various gas-phase chemical reactions to see if they generate amino acids. 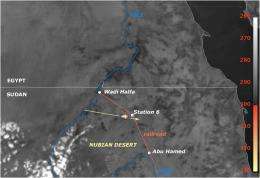 Fragments of 2008 TC3 are collectively called "Almahata Sitta" or "Station Six" after the train stop in northern Sudan near the location where pieces were recovered. They are prized because they are Ureilites, a rare type of meteorite. "An interesting possibility is that Ureilites are thought by some researchers to have formed in the solar nebula and thus the findings of amino acids in Almahata Sitta might imply that amino acids were in fact synthesized very early in the history of the solar system," adds Bada. Hmmm 31 minutes, is that a record? Jmcanoy. You got your first one right away... exhibit A, a presumptuous fool or a sarcastic git. You be the judge. I see nothing here that in any way undermines my faith in God. It's irrelevant whehter there are amino acids, or even aliens in space. So I guess you miss the point that existence of life in space is totally irrelevant to the creation story, and if anything would further validate it in some respects. Any intelligent person would know that science doesn't contradict the existence of God, logic does though. This finding may mean that it is a lot easier and thus more likely that life was not only created here but in many more places in the universe. Considering how many different cave-man religions we have already? The odds aren't that high! Probably no aliens are christian. But christianity will do its usual evolutionary dance to change itself to match new facts (Galileo) and try to convert them as soon as they arrive. Hmmm... little gray lost sons of christ. Creationists retreat to a cosmic view... that the Universe was created by a god. But, they somehow miss the point that there is then no correlation to any specific religion that revolves around man kind... they somehow miss the point that asserting that a god created the Universe does not hold any weight when it comes to substantiating their religion such as Christianity, Islam etc. Yes, a sentient being could have created this Universe, absolutely... there is a non zero probability. Now, you can't link that "Yes" in the previous paragraph to any substantiation of a religion such as Christianity, Islam etc. because there is no greater probability in any direction. Madness. Religion of the organised kind is a closed minded view of reality... you're ignoring the most basic tenants of logic. "Sons of God" refers to angels. Angels are another race of intelligent beings created by God sometime, but it is never directly or even indirectly explained in the Bible. In many places in the Bible, "angels" are seen as superior to humans, but this isn't necessarily always the case. And no, this isn't "polytheism" as there is only one God, and God is the only one who has ever existed, and the only one who actually "Created". There are at least 4 different types of angels physically described in the bible, and possibly more mentioned, ranging from man-like with no wings, and man-like with 1,2, or 3 pair of wings. I hope this clears up this misunderstanding. How does this happen every time? The article is about amino acids being found on an asteroid chunk. Your Ghod didn't put it there with his noodly appendage. It was on the rocks or the collision created the right conditions and then it survived the entry into Sudan. It speaks to the resiliency of the building blocks of life. I wonder if any thought has been given yet to how this adjusts fl in Drake's equation. Dang-a-lang, Pyle, you right as rain. The article is about amino acids found in ubiquitous places beyond any particular solar system, beyond any particularly terran condition. Universe is full of 'life', which I think, is some sort of mixture of complexity and a new/old component of Universe, like Space & Time: Consciousness. WHat is not discussed is what amino acids and whether the amino acids are as a racemic mixture or enriched in d- or l-. This is important to know in order to determine what chemical reaction(s) were involved in their generation. I will not go into that detail here. As far as this devolving into evolution vs. creation, that is inevitable because there are a small number of curious people w/ open minds who want to learn by acquiring enough evidence to make a "wise" guess at the universal truth - a scientific hunch. Then there are the rest of us who already "know" whether it is either creation OR evolution based on a little information and lots of superstition - a faith based belief, i.e. ...religion. ?? When I was younger I "knew" my belief was the truth - now that I've acquired a mind boggling amount of data I've become wise enough to know that in our universe nearly ANYTHING is possible and that almost all of what we "think" we know is pure B.S. Egos and truths don't mix!!! And no, this isn't "polytheism" as there is only one God, and God is the only one who has ever existed, and the only one who actually "Created". Well, actually, no. May I refer you to Robert Wright's excellent and scholarly (but very accessible) recent work, "The evolution of god". If you read it with an open mind (ok, ok, everyone else I know that's an oxymoron!) then I think you will perhaps agree that the bible is indeed founded in polytheism. But back on topic with the amino acids. I think it's very interesting that this study found an approximate 50% laevo and dextro configuration mix in the amino acids found inn the meteorite. This would seem to indicate that whatever caused the origination of the molecules had a random basis to it so that no preferential handedness was involved. I wonder if the researchers have thought about the implications of this on the theories regarding generation in space of amino acids by polarised light (which, if I recall correctly, is postulated to create molecules preferentially in the direction of the polarisation). "A long-standing puzzle connected with the origin of life on Earth is why all of the amino acids in terrestrial organisms are "left-handed", or laevorotatory. The existence of circular polarized light (in which the plane of polarization continuously changes) in the Orion gas clouds is especially significant. Ultraviolet light in the same region, which is obscured by the clouds, should be polarized as well. Ultraviolet light can force chemical reactions to make molecules of mostly one handedness instead of an even split between the two forms. Right-handed ultraviolet light destroys right-handed molecules, leaving an excess of left-handed ones, and vice versa. If the Solar System formed in a similar environment, a 5 to 10 percent excess in the handedness of molecules (the same as that found in the Murchison meteorite) should result. This might be enough to allow the favored types to gain an upper hand during the early evolution of life on Earth"
I guess you don't understand that it was men who wrote the bible, and further edited it for over a thousand years. Something which agrees or supports the bible does not logically prove anything about god, it only proves what those men think they experienced in their own lifetimes. I gave it a jovial 1. I figured it was a joke, but I wasn't about to give a god comment a 5 just in case the creationists didn't get it and thought I was supporting them and their beliefs. that really is all I need to know. Amino acids in space on asteroids and furthermore maybe produced on the asteroid? There is life out there. I can't conceive of 100 billion stars each in 100 billion galaxies with amino acids tumbling through our little piece of the universe and there not being life out there. What are the odds that we find such things within our limited reach? We are not alone.